Hi, I’m Nixiwaka (ni-shee-wa-ka). I am an Amazon Indian from the Yawanawá tribe. I am from Brazil, the largest country in South America. 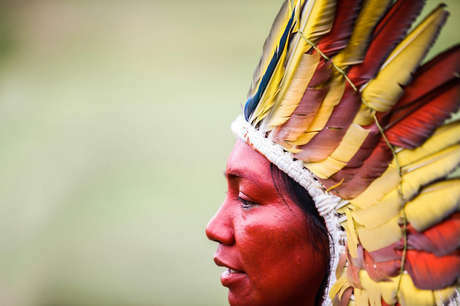 There are about 240 tribes living in Brazil today, adding up to around 900,000 people, or 0.4% of Brazil’s population. 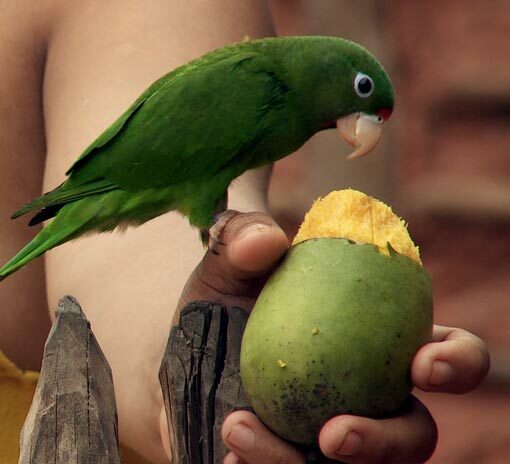 My village is in the state of Acre, in the western Brazilian Amazon. There are over 900 Yawanawá, living in 8 tribal villages. 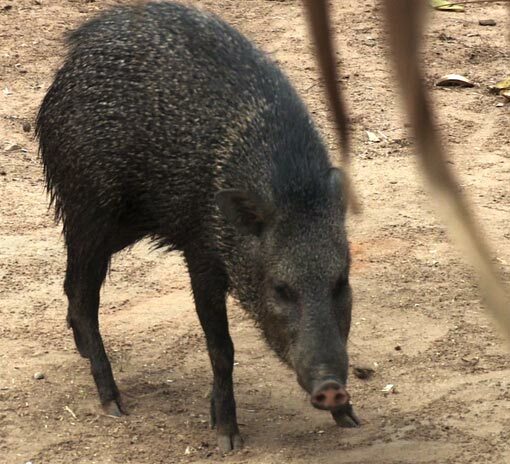 The name Yawanawá translates as ‘The People of the Wild Boar’. There are many hills, lakes, rivers and streams surrounding my village. The climate is hot and damp; the average temperature during the day is 25’C but it can be surprisingly cold at night. There are two seasons – the wet and dry. 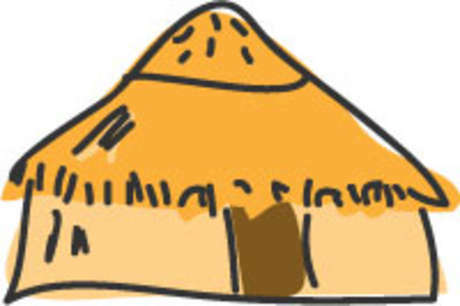 Traditionally we lived in houses called ‘pêshê’. Pêshê have a wooden structure, with a roof thatched with palm leaves tied into place with a strong vine called a liana. Today we have started building different kinds of houses, taking inspiration from Western architecture. We also have large houses called ‘shuhu’ used for ceremonies and meetings. In the middle of our village is an open space where we dance, the children play and guests are entertained. I come from a large family; I have five brothers and sisters. My father and mother are from different tribes: my father is Yawanawá and my mother is from the Shanenawa (‘Nation of Parrots’) tribe. When I was a baby my family decided to move to Tarauaca, a small town near our lands, with my father’s job. In the town I learnt to speak Portuguese, the national language of Brazil. At the age of 10 we returned to our village. The Amazon is the largest rainforest in the world – a giant river basin covering 1.7 billion acres and including thousands of rivers. It spans nine countries in total, although around 60% is in Brazil. We have lived on our land for centuries. Our way of life is developed from our ancestors. We live close to nature. 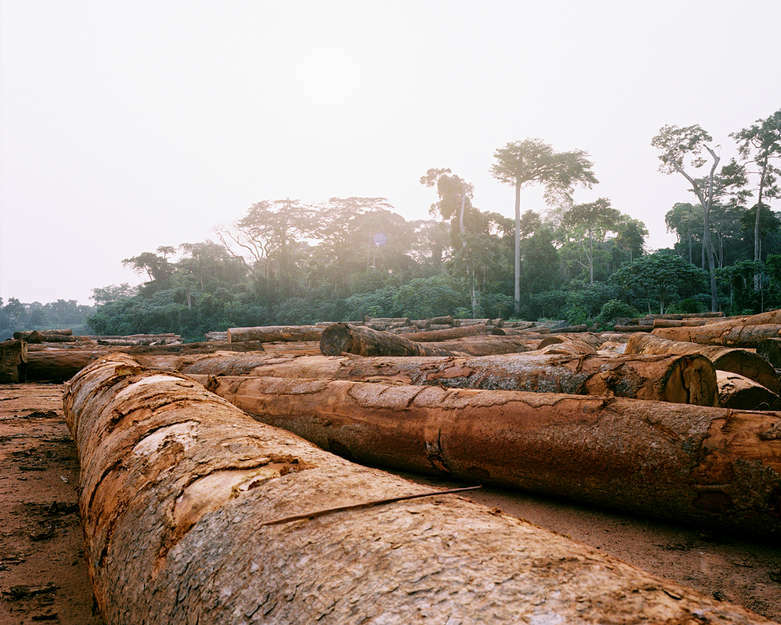 We get our food, housing and virtually everything we need from our rainforests. The rainforest is also our pharmacy. Our spiritual leaders are known as ‘doctors of the rainforest’. They know the powers of our medicinal herbs and plants. 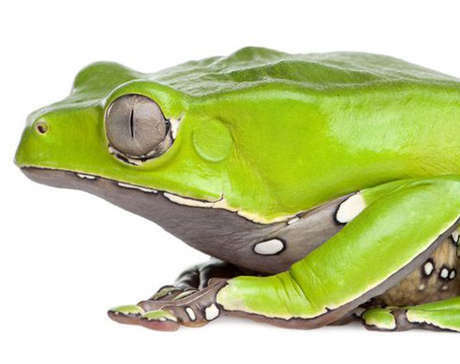 From tree bark to frog saliva, we hold the answers for cures and poisons alike. The forest is a magical place. 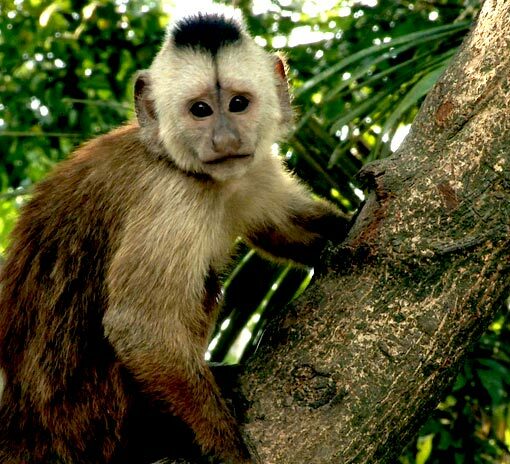 In the rainforest you are surrounded by the constant sounds of animals, insects, frogs and water. My favourite time of day is sunset when the birds come back to roost in the tacana trees, and there is the song of the brown makukau birds all around us. It is very peaceful. At night you are illuminated by the stars, which shine brightly. It’s beautiful! We have a lot of respect for our land, and we have a responsibility to look after it. We have a very varied diet. In the gardens we grow manioc, a big vegetable which grows underground and is boiled or ground into flour to make bread. We also grow banana, papaya, sugar cane, corn and potatoes, and collect plants and seeds from the rainforest. We have two main hunting seasons: wet for hunting and dry for fishing. I was taught to hunt when I was 10 years old by my father and uncles. 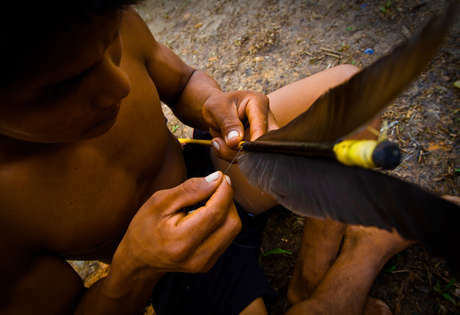 It is only usually Yawanawá men who hunt. We leave early to hunt at around 5 or 6 in the morning – the earlier the better! We usually hunt alone as it is easier to find animals. We would make too much noise if we hunted in groups, particularly in the dry season, when the leaves crunch beneath your feet. We also take part in organised hunts where we gather in straw huts to discuss our route and rest-stops for the long days of hunting ahead. When we are hunting we imitate certain animals in order to draw them towards us. Our most commonly hunted animals include wild pigs, a type of squirrel called a cutia, deer, tapir, and birds like the jacamim. According to our legends, if a hunter sees a wild pig with a white hoof, it will bring him good luck and will make him a better hunter! Traditionally we use bows and arrows but now we are starting to use guns. We also fish in groups, in lakes and rivers. My favourite food is a fish wrapped in leaves which we place into a fire so that it cooks inside the leaf. It is especially delicious with manioc. All food is shared amongst our village so no one goes hungry. Generosity and sharing is essential to our way of life. We also keep pets. My mother had a parrot when I was growing up. The parrot could talk. When we had visitors she would ask, ‘Você quer café?’ (‘Would you like a coffee?’) in Portuguese! Our education begins at birth. We are taught to fish, hunt, gather fruits and plant our gardens. We also have schools in our villages where we can practice our Yawanawá language and remember our traditional stories and legends. We also learn Portuguese and use technology like mobile phones and computers so we can communicate with outsiders. We even use Facebook! We have two shamans or spiritual leaders in our tribe: ‘Yawa’ and ‘Tata’. They are more than one hundred years old! 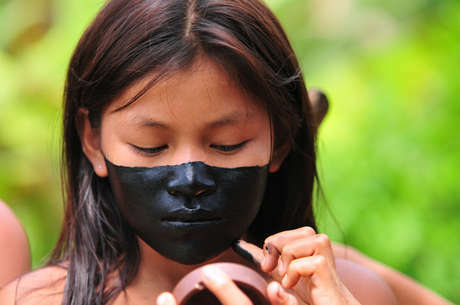 If one of them were to pass on without teaching their knowledge, information about our language, culture, the rainforest and its healing plant medicines would be lost forever. For this reason we have started to write down the names of different plants used for medicines and recording our rituals and ceremonies. The Yawanawá people are known for our songs and our stories. Our songs are old and reflect our lives within nature. My favourite song is called ‘wakomaya’ which means happiness – a song we sing to welcome visitors and to which we dance to whilst holding hands. During our ceremonies and festivals we wear our traditional clothes. Our skirts or ‘shapãnati’ are made from the fibres of the envira tree. We paint our faces and our bodies using annatto seeds and jenipapo dye (from the jenipapo plant) and wear colourful jewellery. 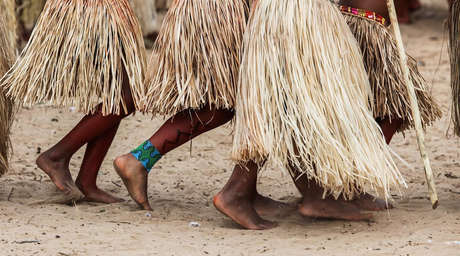 We only wear our ’maiti’ or headdresses on very special occasions or ceremonies where we are connected to the spiritual world. Our necklaces are made from seeds and feathers. The feathers come from birds like macaws, the majestic harpy eagle and the king vulture. When we were first contacted by ‘white people’ many Yawanawá people died from common colds and other diseases to which they had no immunity. Our shamans couldn’t cure them. After contact, the ‘white people’ forced their opinions on us. We were made to change the way we prayed, the way we dressed, the languages we spoke and even the way we saw the world. They criticized our lifestyle and told us that their way of living was better than ours. In 1984, after years of feeling ashamed and rejected, and with the support of FUNAI (the National Indian Foundation), we were able to secure the legal rights to our land. 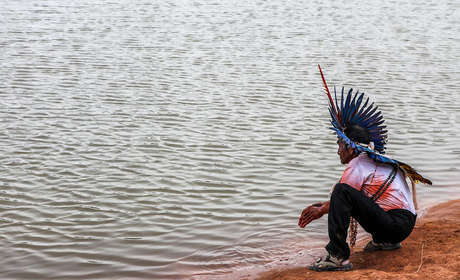 Many tribes in Brazil, like the Guarani, don’t have legal ownership of their land and people have entered their lands, destroying their rainforests for timber, for cattle ranching, for dams, mining, roads and other big projects. The destruction is terrible because the forests are alive. We don’t separate our existence from it, we are all one body and one being: the plants, water, trees and people. There is still racism towards Indians in Brazil today. People think that we ‘live in the Stone Age’. The truth is that we are constantly adapting to the world around us. We aren’t living in the past, we are just different. Survival is very important for tribal peoples – a promise for change. Without their support (and your support!) 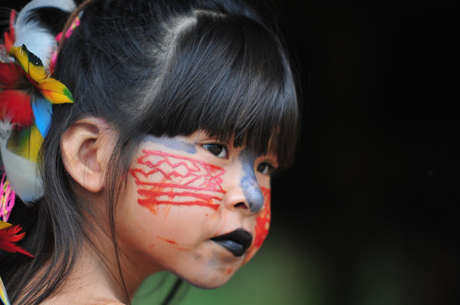 more tribes will disappear forever. 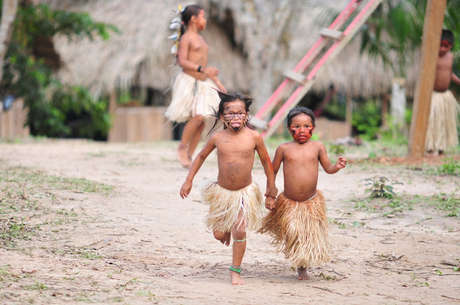 In Brazil today, at least five tribes number fewer than five people and the smallest is now just one person. 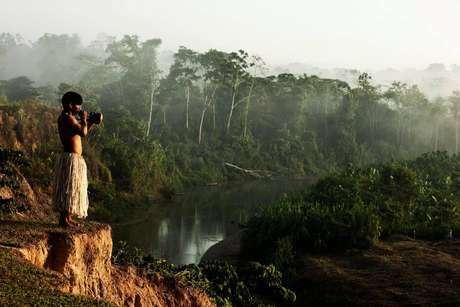 Even our uncontacted tribes, who live deep in the forest, are no longer safe as illegal loggers and miners get closer. 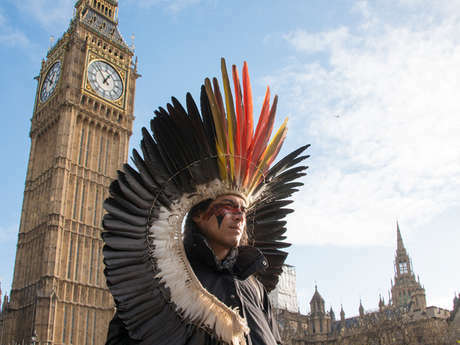 Write letters to the governments and companies who are harming tribal peoples and ask them to stop. Join Survival’s <a href= “http://www.survivalinternational.org/stampitout” target="_blank">Stamp It Out Campaign to challenge racist descriptions of tribal peoples. Lookout for terms like ‘Stone Age’ and ‘primitive’ in the media. From tea parties to cake sales; from sponsored walks to school concerts. Every penny you raise makes a real difference to the lives of threatened tribal peoples. Sign up to receive email updates from Survival.